As we arrived at Hammock Park in the pre-dawn darkness, a full moon was shining and a vocal Chuck-wills-widow greeted us. It made for a beautiful start to our last day of spring banding. We quickly got started putting up the nets. With a shortage of volunteers we pressed the first visitors to the banding station into service (Thanks Seth & Rita). Once the nets were all up it was no surprise that our first “customers” were Gray Catbirds. Although our last banding session of the season did not yield a high number of birds, it did bring us some colorful migrants (both bold and subtle). The female Hooded Warblers brought us some yellow along with 2 very handsome male Common Yellowthroats. The 8 Gray Catbirds brought us their gray plumage with maroon under tail coverts. The gorgeous male Indigo Bunting stole the show with his incredibly vivid blue feathers! The subtle color palette was completed by the Veery with its light cinnamon colored back and lightly dappled breast. All in all we had nice diversity and a total of 15 birds to close out the spring banding season. We did find the later instars of the caterpillar we saw last week. It is of the Eastern Tiger Swallowtail butterfly and their host plant is the Sweet Bay tree. The first three instars of the caterpillar look like bird droppings then the later instars start turning green and gain the cool fake eye spots that make it look like the head of a snake. Also, if you poke at it the caterpillar sticks out a structure that looks like a snake’s tongue. Very convincing! Female Hooded Warbler tail feathers. 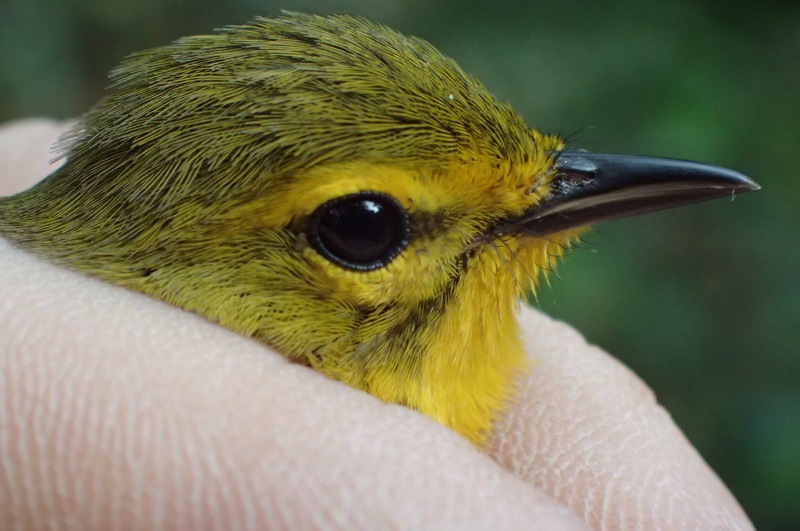 Who says banding songbirds doesn’t hurt? After second year male Indigo Bunting head shot. Male Indigo Bunting primary covert feathers – very nice! Gusty winds haven’t deterred us but the warblers are taunting us. We have had a male American Redstart singing right above the banding station. We have caught a female Prairie Warbler and Palm Warbler. Hopefully more to come. The birds trickled into the nets due to the winds. The Gray Catbirds carried the day with a tool of 7 birds (1 a recapture from 3/22/2015). The rest were a mix of local residents and migrants. We did finish the day with a nice Swainson’s Warbler in one of the nets as we were closing up for the day. We did have a few nature surprises during the morning. First, was a very nice Florida Box Turtle crossing the trail. Volunteer Jake Tucks gave visitors an impromptu talk about the natural history of this interesting reptile. Also, one of the visitors spotted a cool caterpillar of one of the swallowtail butterflies. It is camouflaged as bird poop making it pretty undesirable to eat. Western Palm Warbler head shot. Female Prairie Warbler head shot. A cooperative Gray Catbird taking a rest.